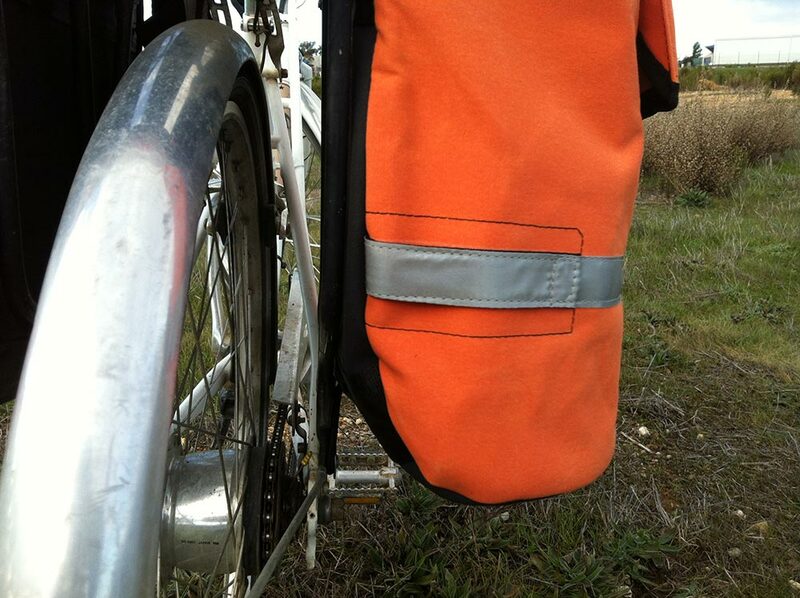 Canvas pannier bag for your bicycle. Used by the many kinds of people who ride their bikes everywhere. 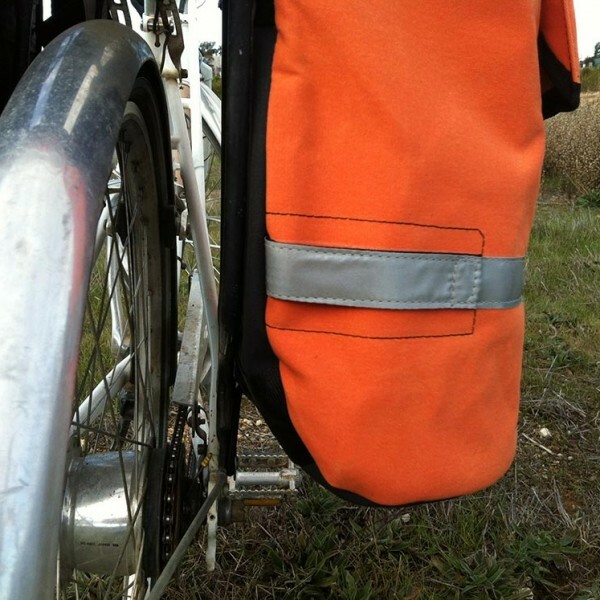 This canvas pannier for your bicycle is designed with a unique attachment system making the bag comfortable to carry around once you’re off your bike. 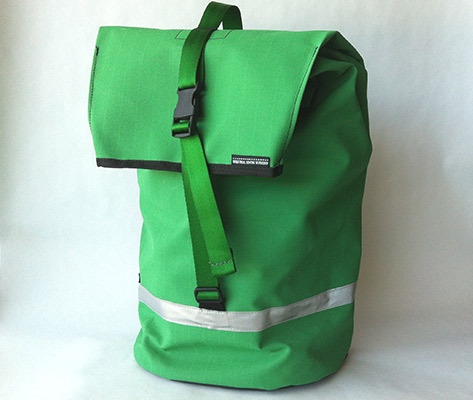 It’s perfect if you’re a commuter cyclist and need to carry your pannier as much off the bike as on. 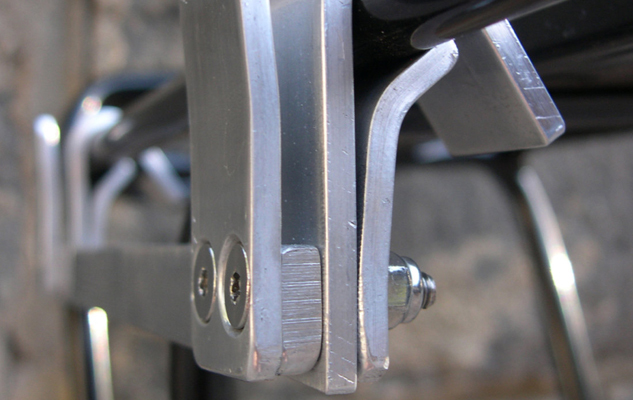 Our hookless design has no hooks on the pannier itself — they stay on the rack. 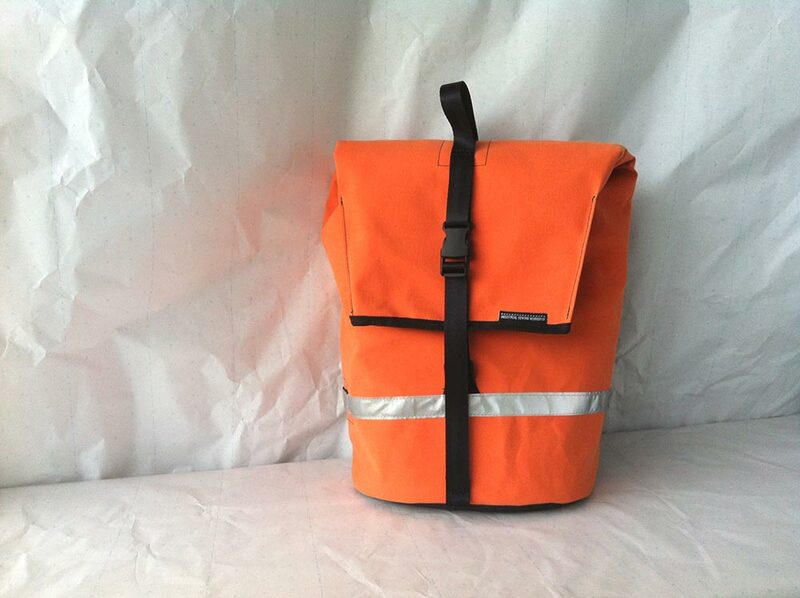 A hanger/hook set is included. 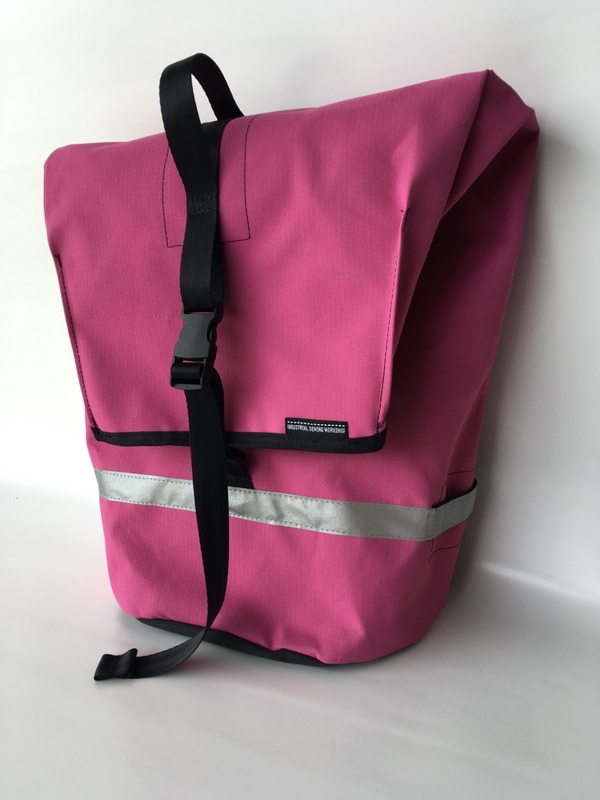 Sold singly, the pannier is designed to sit on either the Right or Left side of your pannier rack (when you’re sitting on the saddle). 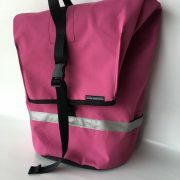 The pannier has an adjustable integrated shoulder strap, a large internal space and is held in at the bottom with an adjustable (and replaceable) bungy cord. 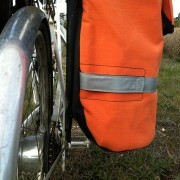 Reflective tape runs from one side of the bag to the other and includes a tab to attach an extra light. 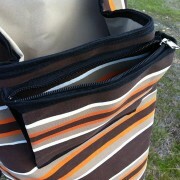 Your keys and phone also get a zippered pocket to share. 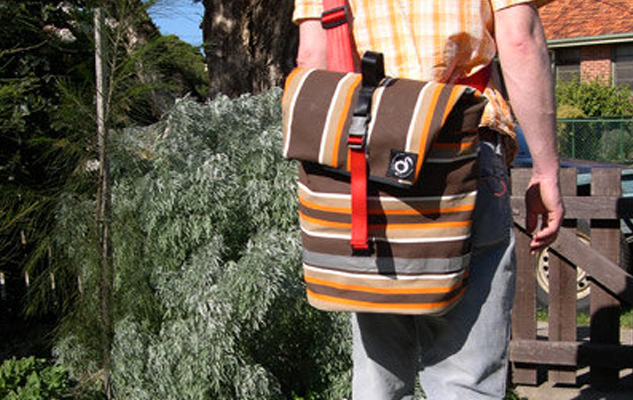 This canvas pannier for bicycles is designed with a unique attachment system making the bag comfortable to carry around once you’re off your bike. 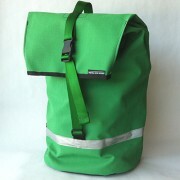 It’s perfect if you’re a commuter cyclist and need to carry your pannier as much off the bike as on. 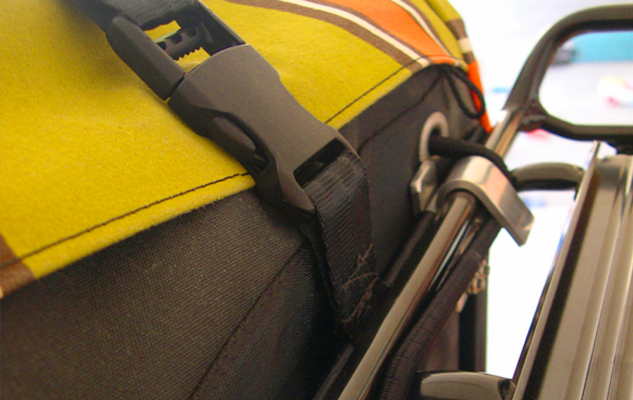 Our hookless design has no hooks on the pannier itself — they stay on the rack. A hanger/hook set is included. 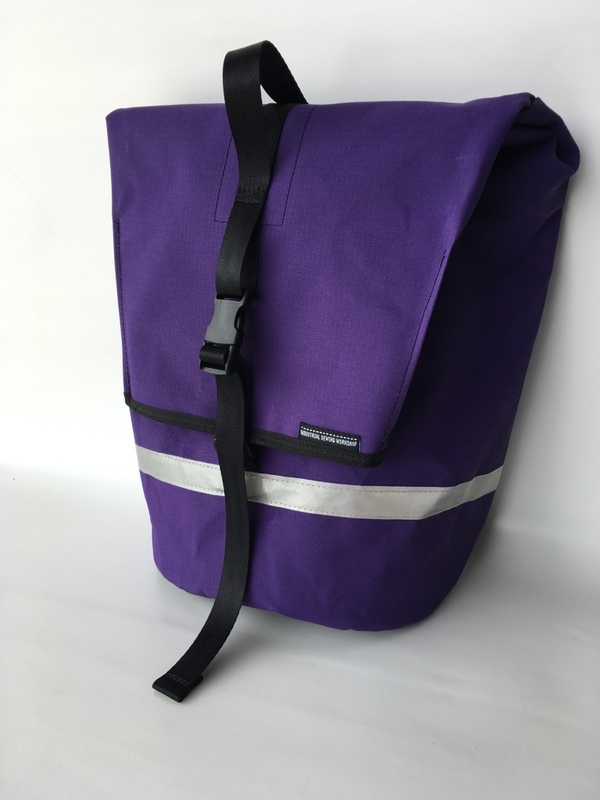 Sold singly, the pannier is designed to sit on either the right or left hand side of your pannier rack (when you’re sitting on the saddle). 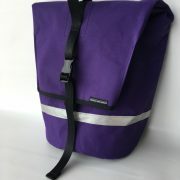 The pannier has an adjustable integrated shoulder strap, a large internal space and is held in at the bottom with an adjustable (and replaceable) bungy cord. Reflective tape runs from one side of the bag to the other and includes a tab to attach an extra light. 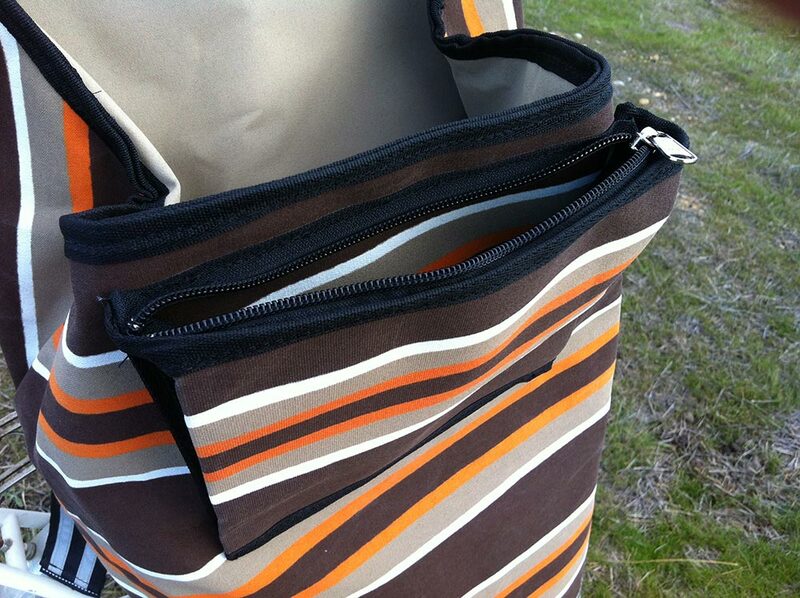 Your keys and phone get a zippered pocket to share. High water resistance is achieved by a two layer canvas water proofing system — the seams do not line up, so water can’t directly travel through. The canvas has been factory proofed after weaving and printing. 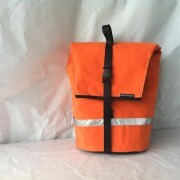 Even unproofed canvas is naturally water resistant as the fibres swell when wet. When the rain stops beading on the canvas, however, it may be time to reproof. Protective sprays are available from any good camping store or you can email us for the brand we recommend.